Note: Please put your phone very close (about 2cm-6cm) to the subject. Features: Shoot larger range of scenery, extended the width of shot by 0.63x,perfect for group selfies, travel, landscapes and more. Features: large scene can be captured by fisheye lens, give images a round, fish bowl effect, takes you into a fantastic world. Features: Remove unwanted reflections from non-metallic surfaces such as glass or water to enhance color saturation. Features: Show you an overlapping vision. Starburst Lens : Add a dramatic Star flare to very bright areas. Features: Add a dramatic Star flare to very bright areas. ✔ Focus On Quality ： Our phone camera lens adopted with premium Germany optical glass and crafted with 8 layer coated to minimize reflections and lens flare,make the picture distortion below 6%.And maximuming clarity,restore the original color and provide outstanding pictures to us.The lens frame is made of aluminum alloy for durability and lightweight. 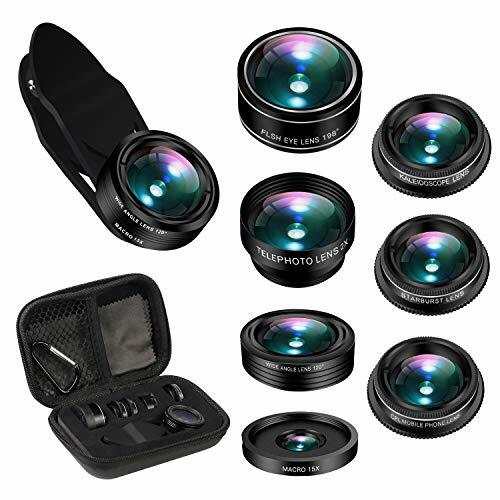 ✔ Everything You Need ： 120°Wide lens, Macro lens 15X , 198° Fisheye lens, 2X Telephoto Zoom lens, Circular Polarizing Lens, Kaleidoscope lens, Starburst lens. Please note that the wide-angle lens and macro lens are screwed together. If you have any questions about this product by AiKEGlobal, contact us by completing and submitting the form below. If you are looking for a specif part number, please include it with your message.